The box set gift package includes Anatole’s first book. In this original and extraordinary work, he expands the limits of the mind to explore the deeper mysteries and inner qualities of life. During more than 35 years of study, contemplation and meditation Anatole has distilled a unique perspective on how life manifests and evolves from esoteric and metaphysical principles. He puts forward a hypothesis for the existence of a vast and largely unexplored realm of superphysical space, functioning in an infinite system of worlds within worlds and operating with scientific, pragmatic precision. Anatole recounts some of his inner experiences, gained while living in various sacred places and ashrams internationally, and introduces a profound vision for humanity and the world – offering the real possibility of peace and prosperity for everyone on the planet. 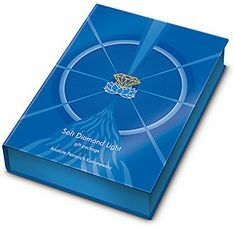 Through the words and music of Soft Diamond Light, Anatole provides a compelling look at the sublime human potential existing within each one of us as spiritual beings. The gift package is a timeless piece, offering a remarkable view of life. It is more than just a book and music. It comes with a powerful angelic presence, invoked by the Soft Diamond Light image and music. The purpose of this presence is to help raise the vibration of the planet. Soft Diamond Light is within everyone.